For most that’ve been to a Government office in their life, the experience might not have been fruitful. Either there would’ve been a delay or lack of cooperation on the part of Government officials, would’ve been the memory that we’ve carried with us. Remember Pankaj Kapoor’s magnificent show “Office Office” that captured the behavioural patterns of the office lifestyle of Government officials with utmost clarity? Well, the current Government of India is trying to change that image in the minds of Indians. The Modi Government is currently making the right kind of noises for all the right reasons in the country. It has recently launched an attendance website that’ll serve as a centralised database for all the Government officials. The website has been modelled on Jharkhand Government’s website that started with the model of having a attendance database for their Government officials. 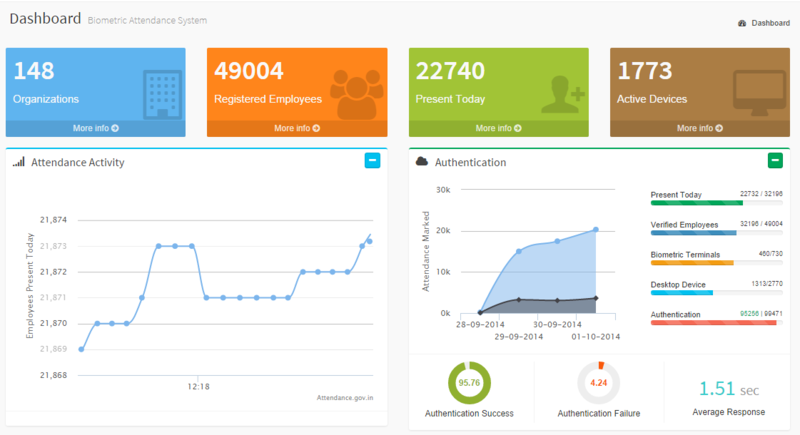 Authentication– This graphically shows you out of the total number of employees how many are verified, present, are on desktop or on biometric terminals as of today. The most fascinating aspect being that it gives you a live view regarding the percentage of successful authentication. Employee Registration– This lets you know that how the employees are taken into consideration. It clearly shows how many are Registered Employees, Aadhar Verified, Aadhar Cancelled, Department Verified and QC Cancelled. Authentication Response- This shows how the authentication response has been provided to the website; via LAN, WIFI or GPRS. Just to give you an idea, here’s how the site looks like. The main aspect that the Modi Government wants to achieve from this website is not just restoring faith among Indians towards Government officials as mentioned above. But, on a larger scale he wants to portray that transparency in the Government offices are his calling. Through this he wants us to know that India is technologically advancing and his motto of India’s growth before elections isn’t forgotten. Maybe, had this process been a part when “Office Office” was being made; Pankaj Kapoor would’ve surely had a different experience to tell.